There’s nothing quite like watching a plant you’ve cultivated with your own two hands grow inch-by-inch into its glorious maturity. That’s why farmers are some of the calmest, most at-ease people you could ever hope to meet – and cannabis growers are probably doubly so. While all stages of marijuana growth require special attention, the most delicate and important stage is flowering. At this point, the plant is more-or-less fully grown. Its full maturity is approaching, at which point it will be ripe and ready for harvest. An exciting time indeed. To ensure all goes well at this stage, here’s what you need to do. Firstly, you should consider the fact that the first two to three weeks of flowering will resemble patterns of the grow stage. Not all popular strains favored by growers will behave the same. Some strains will flower earlier than others. It’s a process, after all, and so it comes about gradually rather than in a single burst. 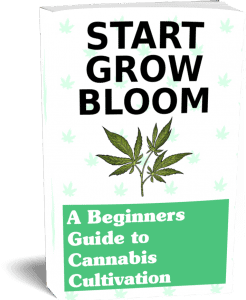 Flower buds don’t appear overnight, it usually takes a week before they start to form. You will most likely have initiated flowering phase by switching the lighting schedule to 12 hours darkness and 12 hours light. This will cause your plant to seemingly go into hyperdrive, sometimes doubling or even tripling in size. Over the next few weeks, the buds will take on an inviting smell and you will a see the crystals begin to form. This is right about when you’ll start getting the first whiffs of your particular strains alluring aroma. Sometimes the smell will be very dank and intoxicating. Carbon air filters are your friend. They will stop the smell from going everywhere. Be patient and wait for the buds to reach maturity, it will all be worth it down the road. 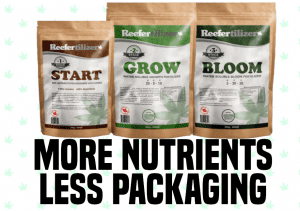 Reefertilizer Bloom formula is recommended for the cannabis flowering stage. Now, onto the crucial part. As we mentioned earlier, many plants will continue their growth even as they enter the flowering phase. This is the reason why a lot of growers choose to continue giving their plants vegetative fertilizer. Applying it for the first or second week of flowering. Vegetative cannabis requires lots of nitrogen, and grow fertilizers contain plenty of this element. During the early phase of flowering, the plant still requires nitrogen to build itself up. The most common reason for doing this, is to increase the size of your plants. Not everyone has the space available to house tall grows. At the end of the day, the thing to remember is that it’s well within your ability to control your plant size through the varied usage of fertilizers. The differences might not be all that extreme, but there is a difference nonetheless. Two to three weeks into flowering, your plants should have attained their maximum size. This is the magical point at which you’ll begin to see buds begin to form. Blooming fertilizer is crucial at this point. Nitrogen is no longer needed in large amounts for plant growth. Aside from bloom fertilizers’ much lower nitrogen content, it contains potassium and phosphorous. These two elements are the essential building blocks of a healthy bud. An NPK ratio of 5-30-20 is very ideal. A combination of high amounts of potassium and phosphorous. With lower levels of nitrogen, to facilitate the slower growth rate. It can go a long way in promoting fruiting and flowering. It will usually come in containers that have detailed instructions. You don’t want to overdo it with blooming fertilizer because it’s possible to over fertilize your plants. This will burn your plants and cause much disappointment. Keep in mind that each plant strain blooms in their own time. The absolute best way to take care of them as they progress to maturity is to pay close attention. Changing up a thing or two here or there as the plant needs it. Take care of it in this way and you can be guaranteed it will take care of you too!